admonition to "write this down," Williams began to describe how slaves made coded quilts and used them to navigate their escape on the Underground Railroad. But just as quickly as she started, Williams stopped, informing Tobin that she would learn the rest when she was "ready." During the three years it took for Williams's narrative to unfold--and as the friendship and trust between the two women grew--Tobin enlisted Raymond Dobard, Ph.D., an art history professor and well-known African American quilter, to help unravel the mystery. 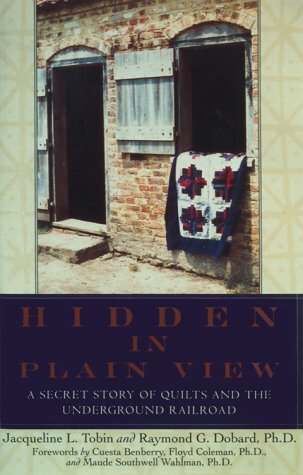 Part adventure and part history, Hidden in Plain View traces the origin of the Charleston Code from Africa to the Carolinas, from the low-country island Gullah peoples to free blacks living in the cities of the North, and shows how three people from completely different backgrounds pieced together one amazing American story. America’s 1999 Norma Farber Award;Big Star Fallin’ Mama (Five Women in Black Music);andNo Woman, No Cry,a memoir with Bob Marley’s widow, Rita. Jones’s short prose and poetry have appeared in theVillage Voice, theWashington Post,and elsewhere. She lives in New York City, where she teaches writing at the New School and the 92nd Street Y Poetry Center. JACQUELINE TOBIN is a teacher, collector, and writer of women's stories. She lives in Colorado. RAYMOND DOBARD, Ph.D., is an art history professor at Howard University and a nationally known African-American quilter. He lives in Washington, D.C. Author's Note. "Write This Down"
"There Are Five Square Knots..."
"The Monkey Wrench Turns the Wagon Wheel..."
"Once They Got to the Crossroads..."
"Flying Geese Stay on the Drunkard's Path..."